Robert Clary (born Robert Max Widerman in Paris in 1926) is best known for his portrayal of the spirited Corporal Louis Lebeau on the popular television series Hogan’s Heroes (on the air from 1965 to 1971 and widely syndicated around the globe). But it is Clary’s experiences as a Jew during the Holocaust that infuse his compelling memoir with an honest recognition of life’s often horrific reality, a recognition that counters his glittering five-decade career as an actor, singer, and artist and distinguishes this book from those by other entertainers. Clary describes his childhood in Paris, the German occupation in 1940, and his deportation in 1942 at the age of sixteen to the infamous transit camp Drancy. He recounts his nightmarish, two-and-a-half-year incarceration in Nazi concentration camps like Ottmuth, Blechhammer, Gross-Rosen, and Buchenwald. In April 1945, the Allies liberated Clary and other inmates. But the news that his parents, two sisters, two half-sisters, and two nephews had not survived the Nazis’ genocidal campaign against the Jews reduced his joy to grief. After the war, Clary made his way to the United States and, against great odds, achieved fame on Broadway and in Hollywood. 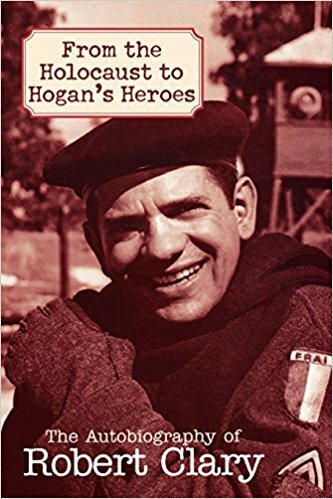 From the Holocaust to Hogan’s Heroes is Robert Clary’s extraordinary account of his remarkable life both as a survivor and as an entertainer. Once read, it will not be forgotten. When I saw the book, From the Holocaust to Hogan’s Heroes, I knew I had to read it. This mainly because I love watching old movies and shows like Hogan’s Heroes. Robert Clary is a great supporting actor in them. I really enjoyed learning about Clary’s life and how he became an actor on Hogan’s Heroes. I feel this story was very well written, but also brief not going into a ton of detail. I believe this is another good view of World War II from a Jew who came from France and lived through Hitler’s reign.